I’m a tech fiend, not from a mad-capped desire to own every little gizmo I see, but rather from the philosophy to collect the tools needed to create whatever creative thing I imagine – or am driven to explore. I’ve been running through film and digital raw files for a many years now – landscape, cityscape, portrait, studio and location lighting, it’s all up there in my head. Creative vision and work flow? It’s all good – but there’s always a way to expand and take things to the next level. Photography only excites the visual areas, but some concepts require – or at least are greatly enhanced by communicating audio elements as well. I love the concept of getting into video, but it’s also another medium to master and a fortune of gadgets to collect. Plus, I love using just one or a series of high-quality images to communicate a concept. 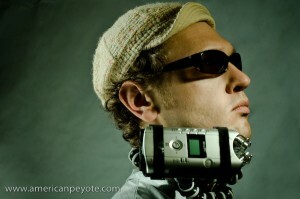 Must photography become video in the form of a super video device like the Red One Scarlet? If the story can be told with one high quality image, why use video? Well, I often imagine concepts as videos in my head, combining audio and imagery in one to convie an experience to the viewer. So how can I use current photographic techniques and add elements of audio excitation? Often I walk dark city streets and bad poetry fills my mind. An image of that dark street doesn’t communicate the poetry I’d like to rap to the viewer. And if you add text, like in a blog, the tone and depth of the voice is lost. Bacially, photography only gets you so far, and the idea of integrating audio with photography has been sticking in my head for a while. But how to do it? How do you collect high-quality audio to effectively complement the visual? 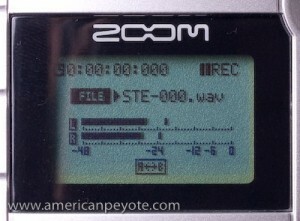 With another high-priced gadget, in this case, a studio quality digial audio recorder like the Zoom H4. The Zoom H4 is a handheld studio quality digital audio recorder. After a not so intensive research look into the different digital audio devices on the market, the Zoom H4 was an easy pick, as it comes with a high-quality microphone and a reasonable pirce tag. There are various extremely well-written reviews of the H4, but the one you are currently reading comes from a film/digital photographer who needed a device to mix well with his other digital capture and expression devices (expensive toys). I’m not what you would call “knowledgeable” about audio gathering. Bascially I wanted something like the Ricoh GR Digital camera; high quality media capture in a hand-held package. My desires for the H4 were pretty simple: the ability to quickly choose between uncompressed WAV for high quality sound gathering, or mp3 for lower quality when desired. Analogous to choosing .tiff or .jpeg as a digital camera analogy. 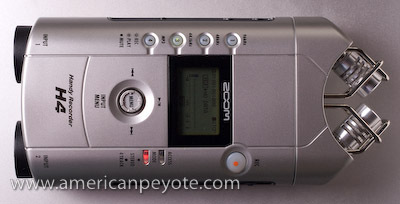 The Zoom H4 is crazy easy to operate, there are a few buttons to control microphone gain, file type, and recording. On the left side of the Zoom you choose between mp3, or various uncompressed WAV file sizes. Push the big record button once and it starts flashing, with the headphones on you can hear in real-time how the audio sounds. On the display you can see if the sound levels are being read well. If they’re too low, you just increase the microphone gain (low-medium-high). This allows you to boost the microphone sensitivity higher or lower (like changing camera exposure) as needed to optimize the recording quality. You know if you need to or not because the input levels are displayed (similar to a histogram in digital cameras), which gives you an idea of which gain sensitivity (low-medium-high) to use. 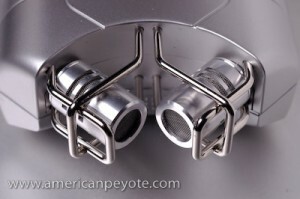 In general you want the audio input levels to be as high as possible without exceeding the range of the microphone. This is akin to pushing the exposure on your digital camera as far as possible without clipping the highlights (exceeding the exposure limit of your camera). Press the record button a second time and you start recording. Press it a third time and the recording stops and the file is saved. You can easily navigate the recorded files and play them back, delete them, format the card, etc. The Zoom H4 looks like a taser, but feels more like a Star Trek tricorder. For collecting ambient street and bar music you only have to be sure the microphones are protected from the wind or not bumped/touched during recording. It’s somewhat directional, something akin to using a 28mm wide angle lens on a 35mm camera. Just point in the direction of your audio subject and start recording. There are a number of more advanced features which I’m not qualified to get into. With the XLR inputs you can hook up fancy microphones and record multiple tracks to use the H4 as a pocketable studio, or record directly to a computer via the USB connection. No doubt this is crazy useful for journalists, podcasters, and people who are really into the home studio thing, but I’m into the high-end hobby photography thing, and recording directly to the solid state SD card is what I bought H4 for. Recording in uncompressed WAV format can eat up a lot of memory if you’re recording speeches or are out for the whole night doing street poetry. Like with a digital camera, the audio files are easily downloaded to a portable drive like the Hyperdrive Space. For basic recording, a couple of 2GB SD cards will serve your recording needs well. 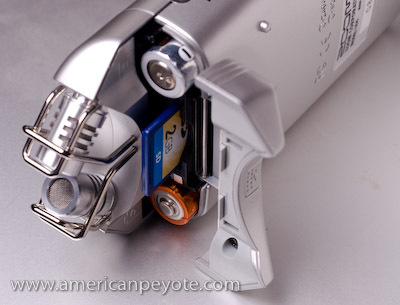 The H4 takes AA batteries, and will last for a couple hours of actual recording time before dying, this and the fact that the SD card is actaully incoviently difficult to access are the only real drawbacks I’ve found so far. 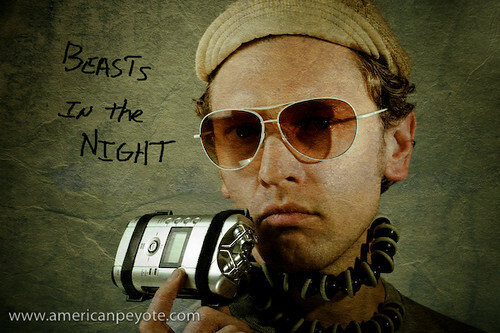 Those of us who got interested in the concept of Gonzo reporting by watching Johnny Depp in Fear and Loathing in Las Vegas walk around a bombed out hotel room with a microphone taped to his head will appreciate the flexiblity of mounting the Zoom. For a throat-to-the-wall night of fast moving action and high qualitiy auido gathering, the H4 can be mounted to a Gorilla Pod and wrapped around the neck of the reporter. 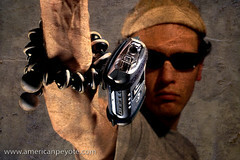 If Hunter S. Thompson were just starting out in 2008, I could imagine him picking up a Zoom H4 to do his work. The Gorialla-Pod-around-the-neck mounting system allows hands free continuous recording of events after the record button has been pushed. It can also be easliy mounted to the forearm and the Freak reporter can then run around all night pointing the Zoom H4 at people like a dropout from the X-men school of Gonzo reporting. I imagine I’ll move towards video at some point. 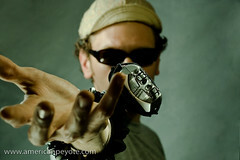 But here’s my rational: I love having a high quality image which invokes emotion or tells a story. Doing video just because you can won’t necessarily create a better story telling style. I just feel limited in that many times the environment/subject is not just a still life, but a combination of audio and visual elements. Yes, many point-and-shoot cameras do video and audio recording, but we all know the output is not high quality. The ability to record studio quality audio right along with high quality images is a very powerful combination. Now the challenge is to elegantly combine the photography and audio in one media package. If you combine great photography with cheesy audio you’re just going to turn people off because it will come across as a gimmick. One needs to take the “eye” for creativity from photography and find the creative “ear” for audio recording. No review is complete without output, so here is a sample from the Zoom H4, of some bad street poetry put together on a warm summer night in New Orleans, somewhere near Burboun Street. The wedding I had just attended was over, but I had no desire for sleep and instead walked through the city collecting ambient sounds and spewing lines into the open air for the H4 to record. It’s not my best work, and is highly reminiscent of my worst photography work, ill-thought-out and laking in focus or direction. The coming challenges include developing a mixed-media workflow to elegantly combine visual and mixed-down audio into one package. But for now, there’s just this short piece of Bad New Orleans Street Poetry, a combination of spoken word and ambient sounds.